HEALTH MINISTER JAMES Reilly has been asked to explore the possibility of banning the sale of cigarettes in pubs, off licences and supermarkets at the Fine Gael Ard Fheis tonight. The party’s 77th annual Ard Fheis has got under way at the RDS in Dublin with delegates adopting a motion which asks Reilly to look at introducing a ban on the sale of tobacco in premises licensed for the sale of alcohol. Another motion to regulate the sale of electronic cigarettes was also formally adopted as Fine Gael policy with Reilly having already ordered a review of e-cigarettes. He said last year that he is not convinced of their safety. Delegates debated several motions on the issue of healthcare tonight with Reilly’s proposals to introduce universal health insurance the focus of earlier speeches from the Minister and Taoiseach Enda Kenny. Cian Kelly, a member of the Limerick City constituency executive, who proposed the motion on banning the sale of cigarettes in pubs and off licences said it was about breaking the link between tobacco and alcohol. “This is for what’s colloquially called a social smoker,” he said, admitting he is one himself. Barry Walsh, a member of Fine Gael’s executive council, warned about the dangers of e-cigarettes. Fellow TD, Regina Doherty said the “clear message from Fine Gael is: Hands off our children, you’re not getting them”. However, there wasn’t universal support for the banning of cigarette sales in pubs with one delegate in the audience warning of the impact it might have on rural pubs and shops. Rather than adopting a motion to legislate for an outright ban on cigarette sales in pubs, off licences and supermarkets, the Ard Fheis accepted an amended motion which asks Reilly to explore this possibility. Speaking on the two cigarette motions, Reilly said that attractive cigarette packaging is “entrapment” for young people and said the whole issue of tobacco is a personal one for him having lost both his father and brother to smoking-related diseases. “I’ve lost loved ones. I’ve seen my father have a stroke and be blind for the last 14 years of his life,” he said. 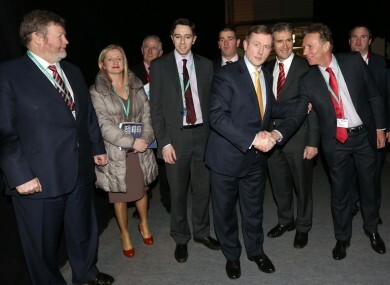 Email “'Hands off our children, you're not getting them': Fine Gael debates smoking and e-cigarettes ”. Feedback on “'Hands off our children, you're not getting them': Fine Gael debates smoking and e-cigarettes ”.